Believe Dream Create with Maria: Apron Anyone????? Sometimes you have a day where everything aligns just right. Four VERY tired girls and one VERY willing (ha ha...Linda Willis, get it) teacher. My friends, Kirsten, Carolyn, Julia and I played with no agenda, just a willingness to learn, relax and have FUN....and that we did! Of course, none of us finished our aprons. We got home and said we all wanted to show them together. We planned the date...life got in the way. We cancelled the date. This happened more times that I want to tell you. Thank you Linda Willis for a day to remember! Speaking of Linda Willis, if you have never taken a class with her and have the opportunity--DO IT!!!!! She is pretty darn AMAZING! So giving of her knowledge and talents. She will be at Art is You Stamford teaching and so will my buddy Carolyn Dube. Oh what fun that would be--to take a class with Linda and then one with Carolyn!!! You know what else I'm celebrating with my friends today??? welcoming her into blog land. Watch out art world....here comes JULIA KELLOGG!!!!! 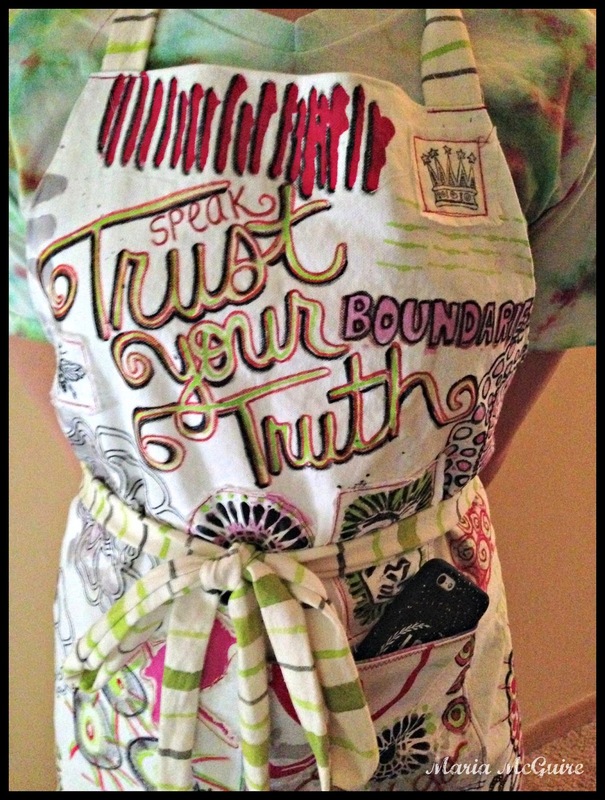 If you haven't already, I would LOVE for you to see the aprons my friends made! A BIG thank you to my daughter for modeling for me! Maria, your apron is over the top cool! They're all so different, Linda will be proud of us I know. And thank you for the really special introduction into the art / blog world. I'm ready to take flight. So glad we all agreed to do this. 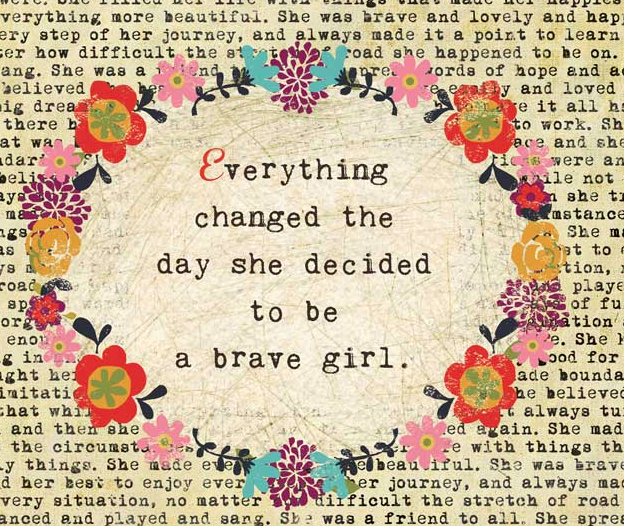 Each time I learn a little more about the process. Glad to see you had a wonderful day! I know you are following yur dream so you will have many more wonderful days. Have a Blessed day, DIANA L.
Oh my goodness! You added so much incredible doodling and drawing to this!! And a hem! Love how this turned out!! One of these days I'm going to get to Art is You... but in the meantime, I'm loving seeing the apron posts! It looks like you ladies had so much fun :D And I love your apron! I love how your apron turned out!! So cute! But I dare say the best thing of all here are the friendships and connections made. The apron was just a fun bonus! *cheers*! 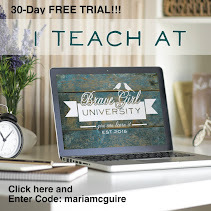 And I dream of joining you all some day in a class…I want to be there! 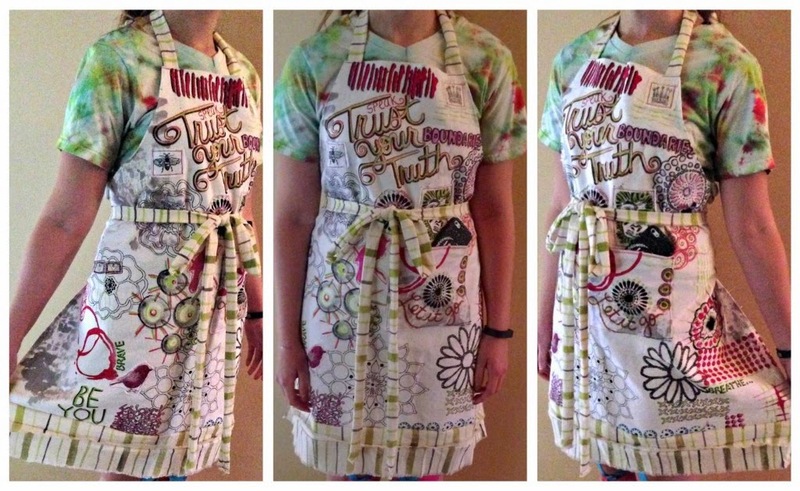 Love, love, love your apron! The stencils and colors you chose are great! And the lettering is wonderful! This has "Maria" written all over it (not literally) in a GREAT way!!! Turned out great and seems like the you I know. he stencils and colors you chose are great! And the lettering is wonderful! 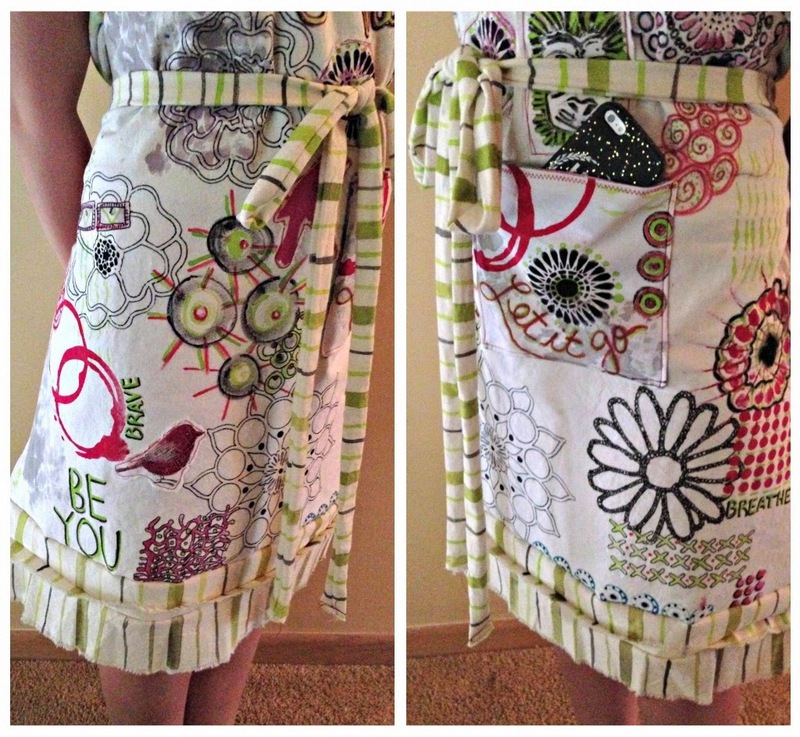 Its wonderful how you incorporated your style and red into this apron! Thanks for sharing!